Recently I received a marketing email from a women’s athletic apparel company advertising a sale on bathing suits. Great. I needed a new bathing suit. 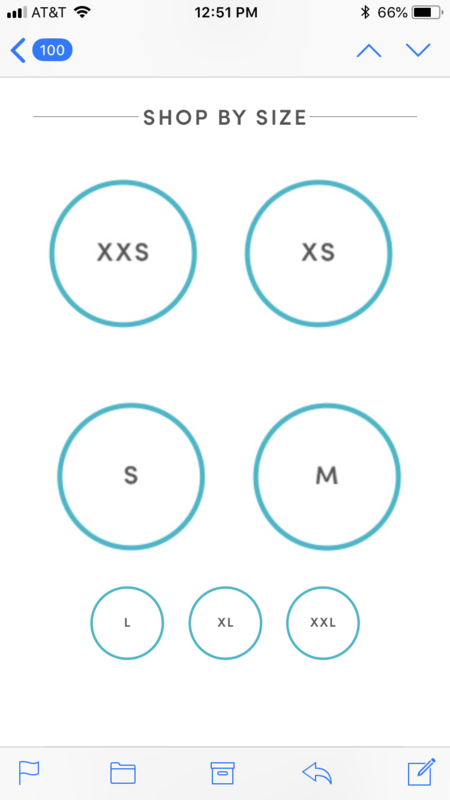 But when I scrolled down to the size filter, I was appalled to discover that sizes XXS through M were emphasized and sizes L through XXL were devalued, shown in a smaller, secondary position. Were women who wear these sizes being discouraged from buying bathing suits? It certainly looked that way. Personally, and on behalf of the majority of American women who wear larger than a size medium, I was offended. I vowed I’d never buy another item of clothing from this company again, especially as I’d previously believed that they embraced body positivity. I posted my frustration on Facebook, tagging the company. Friends chimed in, equally appalled. The company replied. The problem wasn’t a preference for smaller sized women, they assured me, but rather that the email was showing differently on various platforms. Sure enough, on my desktop, all the sizes were depicted equally. When the email rendered on iOS on an iPhone, the design was modified, changing it so that certain sizing options were emphatically large, others smaller. Oops. I must admit, their explanation, while logical, still left me disgruntled and unlikely to make a purchase in the future. Why? They breezed over my sense of being size-shamed, citing a technical glitch as an excuse and ignoring my feelings. And this is at the heart of what church communicators need to understand. All good ministry is, inherently, about relationships, and relationships are built on trust. Therefore, we must think of the digital space as relational, not informational. And when we provide incorrect information, or when technical glitches cause miscommunications or frustration, trust is broken. Relationships are damaged. Merely offering a technical explanation does nothing to acknowledge, let alone, repair the relationship. If I show up at the worship time listed on a church’s website only to discover that it isn’t accurate, I won’t be coming back. I no longer trust that church. If I have to pinch size and resize to read a church email or a pdf that isn’t responsively designed for my mobile device, I’m frustrated. I have a sense that communicating with me isn’t a priority for the church and they don’t care about me. If I try to make an online donation and must enter redundant information, go through a complicated process to create an account, or get passed through to an unfamiliar payment processor, I’m skeptical and annoyed. I’m convinced the church doesn’t need my donation because they’ve made it that difficult for me to contribute. It can be tempting to dismiss digital mistakes as inevitable and unavoidable. And it’s easy to say people should just expect and accept the inefficiencies, glitches, and foibles of technology. I get it. Church communicators are usually spread way too thin, and it’s often easier to apologize for a mistake than to put in the effort to get it right in the first place. But if we truly want to be hospitable, if we truly want to meet people where they are, and to value and acknowledge them, it’s important that we get digital communications right. This means having accurate and timely information about worship and easily accessible contact information on all digital platforms. This means cross platform testing (which would have presumably avoided my bathing suit brouhaha). This means responsive design that prioritizes the fact that the majority of internet usage is done on mobile devices. 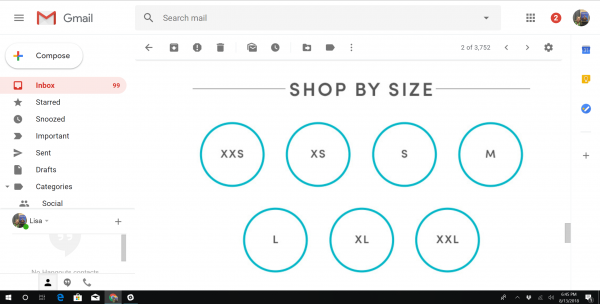 This means choosing email templates that are also designed to adapt to the plethora of different email platforms that people use. This means thinking about the number of click-throughs people must complete to engage in a transaction or complete a form. This means knowing and following established website design best-practices to give users a consistent and predictable experience. This means acknowledging and replying to those who engage the church on social media. This means respecting privacy, considering the way peoples’ data, images, and stories are used. This means always honoring the person, as a child of God, worthy of dignity and respect, that is on the other end of every digital engagement. Communication is ministry; and all good ministry is relational. We need to make careful technical choices and follow the best technical protocols in order to fully live into these relationships. Speaking of relationships, how did my interaction with the athletic apparel company end? It hasn’t, really. I am undecided as to whether I’ll buy anything else from them, and if I do, it definitely won’t be a bathing suit. Unless, of course, they respond affirmatively to a tech friend’s suggestion on my original post that “a free bathing suit would be nice for Quality Assurance testing your crap software....” Now that might rebuild the relationship!